Our respected colleague & sensei, Art Byrne, has just published this fine book. Famous for turning around Wiremold, Art moved into private equity, where he continues to apply his successful turnaround recipe. The Lean Turnaround's recipe is "simple"; the way hitting a golf ball is simple. Lean tools such as standardized work, visual management and 5 S, set-up reduction, kaizen are pulled in as required. 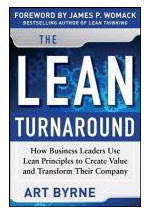 The Lean Turnaround effectively conveys the senior leader's perspective & the work required to turn any company around.